I had a post about 90% ready to post yesterday, but I literally didn't have a single free minute once the kids left for school. I spent 14 HOURS prepping, priming, and painting my bedroom. I wanted to paint the trim white, and I'd never painted trim before, so I wasn't sure how that would go. Also, our walls were pretty dark (and sponge painted) so I wanted to make sure to get them covered well. The first couple of hours or so, I spent my time taking the doors off the walls (closet, bathroom, and bedroom); taking the TV off the wall; removing the light and socket covers; moving the furniture to the center of the room and covering it, filling in holes in the walls from screws; sanding and washing the walls. Then, I did a coat of primer, which took FOREVER. I had to carefully prime the trim around the windows, doorways, along the floor, and at the ceiling. By the time I was done with a coat of primer, eight hours had passed! I had been thinking that I would need two coats of primer and two coats of paint to cover the previous dark color (with a light yellow). Once I finished that first coat of primer, I wanted to just quit the whole project and go back to how it was before, haha. My back was killing me, and my muscles were just aching. Not to mention that I was ravenously hungry (how is it that painting takes so much energy?). After a quick Google search, I decided to chance it with just one coat of primer. I figured if worse came to worst, I could just use a third coat of paint. Painting the trim white was even more tedious than priming, because I had to be careful not to get the white paint anywhere other than on the trim (when priming, I just covered the walls and trim together). Finally, when the trim was done with one coat of primer and one coat of paint, I decided to do the walls and hopefully be good with just one coat. The second I brushed on some of the yellow paint, I thought, "Oh, crap, this looks like Easter!" I wasn't imagining an Easter-yellow--more of a sunny yellow. Jerry got home shortly after that (the twelfth hour at that point) and he really loved the color. I really didn't want to change the color, because I was just ready to finish the whole thing, so I continued with the Easter-yellow. The more we painted (Jerry did the rolling while I painted around the trim), the more the color grew on me. I really like it! I'm trying to figure out what to do with the windows. Before painting, I was thinking we'd have to get white blinds, but I discovered that I actually kind of like the contrast of the dark brown ones (they look black in the picture). I hung one curtain rod this morning, but I'm not sure what my plan is yet as far as window treatments, so I'm going to figure that out before I hang the other rod. Suggestions? Should I switch out the blinds for white? We finished painting at 10:00 pm (I had started at 8:00 in the morning). Once we moved the furniture back, and hung the blinds back up, I was completely exhausted. I didn't cook dinner, so Jerry had picked up a pizza on the way home. I scarfed down three pieces--it was like I couldn't even eat them fast enough. It's so odd! Even after running 10 miles, I don't feel that ravenous. Painting is exhausting. When I woke up this morning, every muscle in my body was groaning. Painting the bedroom was a better strength workout than any other I've ever done. And today is going to be just as challenging--I have to hang the doors back up (and possibly paint them, I haven't decided yet); hang curtains; hang the TV; hang a ceiling fan; and hang a mirror. The final part of our bedroom project will be new carpet, but that will probably have to wait until next year, because it'll be expensive. 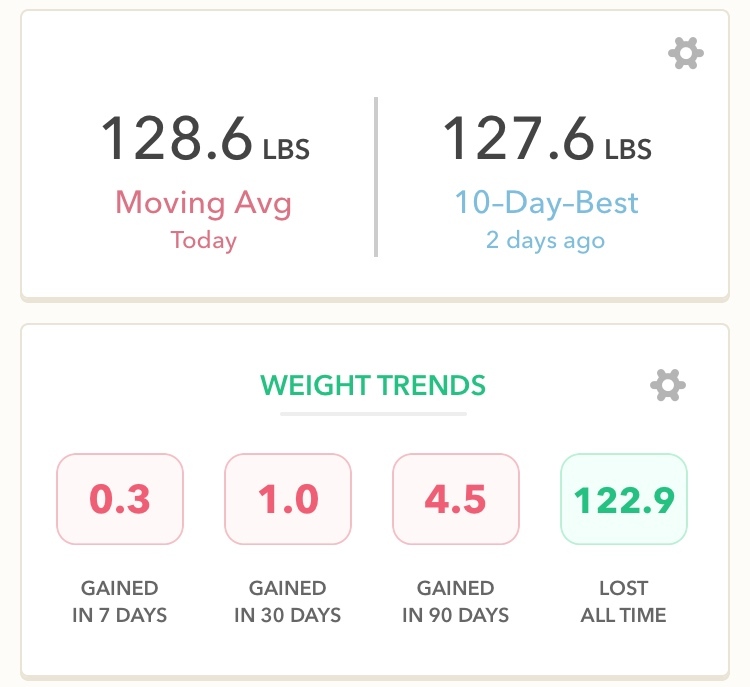 Not putting on my typical 10 pounds of "spring" weight (I always tend to gain weight through the spring and summer) has been pretty challenging so far. Yesterday, it was 90 degrees outside! As I was working on my bedroom, I was thinking about how good a few Summer Shandies would taste, but I'm going to try and limit the alcohol to just social situations this summer, so I don't wind up with lots of extra calories on a day-to-day basis. Alcohol and ice cream are two things that tend to get me in trouble with my weight every summer. Jerry and I are starting a food challenge today, which I'll write about tomorrow. I had the whole post about it almost done yesterday, but like I said, I just got too busy to finish. It's kind of a fun challenge that we've done before, and I'm looking forward to it! Looks good! I'd switch the blinds for white. I like the lighter colors. I'd do white blinds and maybe just a valance above each window to keep it open. The room turned awesome--love the color! The dark blinds look great! Adds a bit of contrast, and like Erin said it may take away from the white trim. I would consider putting a valance above each window, but the kind that are flat. They kind of look like a box with fabric on it? I don't know the technical term but if you google flat fabric valance you'll get an idea. Maybe in with some yellow to match the walls or sage to match your bedspread. The room looks awesome by the way!!! At first I thought the blinds were chalkboards above the nightstands (I didn't realize those were windows/blinds). I think the dark blinds work well. I'm trying to picture white blinds instead and between the furniture and trim white blinds would be just too much white. Although with that said - if you opted for white blinds you could go with a stark contrast valance to break up all the white. Either way - I would simply go with a balance for the window treatments. Valance not balance - silly autocorrect. It looks good! That was a lot of painting. I do like what you had done with the curtains in the before picture, it made it look like you had a huge window. Nice work! And the view out your window looks amazing! I'd go with white blinds too. I have similar Windows and I have two panels on each window, but my dresser is in the middle. Whew! What a huge project you undertook! It looks great so far. I too like the contrast of the dark blinds. Of course that could change with the drapes you choose, but I think white blinds would just be too much white. Interested to hear about this food challenge. You always have such interesting ideas. I have to keep changing things up or I'd weigh 328 lbs again. I would change out the dark blind for white though. It looks so nice! Love the furniture, too. Painting a room takes me days and days; I'm so slow. I can't believe you did all that in one day. The dark blinds bring in some nice contrast and will help keep the room darker. An accent pillow with dark brown might tie it in some. Valances that are very straight in white with a touch of green would be lovely; toile is always nice in a bedroom. Hope that helps. Goid job on all your hard work!!! I would do white blinds and maybe consider some gray curtains. I love the yellow and gray combo that seems so popular lately. Love the color on the walls! I think it looks great! I'm interested to hear about your food challenge. 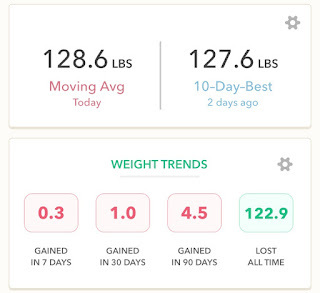 Also, another awesome week of weighing in! You did a great job painting the walls and the furniture. Definitely looks more modern. I hear you about the spring/summer weight gain. I am the same way. Fall is my favorite season to spend time and exercise outdoors; that's when I usually lose weight. Then when temperatures rise, I just want to stay inside where there's AC! This year I'm doing better though and I'm confident I'll be able to maintain. I love the new room! Very light and summery! i love the new color! and the update on the furniture, it looks great! i usually need an extra hour of sleep and a day off of working out after moving furniture around. it's exhausting. I love the color. I agree the contrast of the blinds give it a modern feel. I think if youre going to add curtains you might have to switch out for white blinds. Unless maybe go with light curtains?? Or just leave Brown blinds, no curtains. I feel your pain, girl! I painted all of my trim and interior doors white a few years ago. It's sooooo much work, but so beautiful when it's finally done!! The room looks so great! I have a random question for you -- How did you get your family/spouse involved in your weight loss when you were first starting out? I want my hubby involved but I don't want to seem too pushing or naggy. Thanks in advance for any suggestions and THANK YOU for your blog -- so inspiring and motivating! My husband actually wasn't interested in changing his lifestyle when I started my weight loss journey. Since I cook for the family, I just cooked the same foods as always, making small changes (maybe ground turkey instead of beef, and things like that) and I stuck to one "normal" sized portion. I didn't worry about my husband at that point. But after a few months, when he saw all the progress I was making, he was inspired to start working on it, too. And then he got on board all by himself! I agree, being pushy or naggy isn't the way to go, because he'll probably get turned off to the idea--but if you lead by example, he'll probably get inspired! Thank you for your reply! What good advice -- we can only control ourselves, right?